That’s it. I love A.S. King. Like, love her love her. Not in a creepy way. I just want to marry her books and I want her to perform the ceremony. Maybe she can move in with me? Too much? 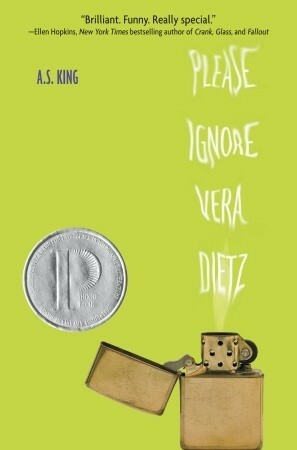 I think Vera Dietz is my new favorite heroine of all time. She was a complex and flawed character and I loved her for it. I can’t imagine going through what she went through and surviving it. She made mistakes but they were understandable ones. Sometimes while reading I felt like I knew her. She felt so real. I need to re-read Vera again. I can’t top thinking about her. Vera wasn’t the only aspect of the book I enjoyed. The relationships in the book were very difficult, amazingly written and complex as well. I think the Charlie-Vera relationship was the one that impacted me the most throughout the book. It started out simple and it progressed into a catastrophe. And even though I knew in my heart that Charlie wasn’t good for Vera, my heart died a little every time I remembered that he was dead. That’s how much I loved his character. Please Ignore Vera Dietz was intriguing, fast paced and a book you’ll be thinking about for a long time after you've read it. If you haven’t read a book written by King do read this one first. I think this one is a good introduction to A.S. King’s writing world.